SLAs are an important component in third party risk management for both your ongoing monitoring requirements and your contract standards. SLAs define the expected performance targets, establish how the service will be measured and the remedies or penalties (to include termination for repeated failure), if any, for non-compliance with the agreed service levels. 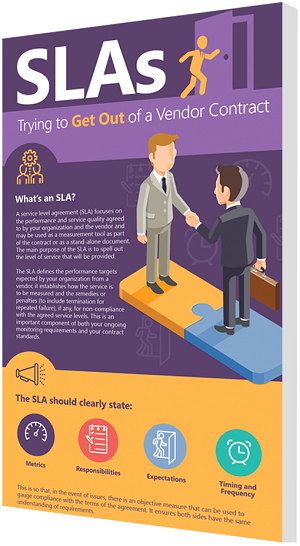 Today's new infographic covers what you should know about using SLAs with your vendors.